Category 5 storm Mangkhut hit Luzon on September 15; millions are affected. The Adventist Development and Relief Agency (ADRA) office in the Philippines has deployed an emergency response team to assess the situation and provide aid to some of the communities most affected by Super Typhoon Mangkhut, known locally as Ompong. The powerful typhoon, equivalent to a category 5 hurricane, made landfall in the northern island of Luzon on Saturday, September 15, affecting more than 4.6 million people and forcing more than 51,000 people into evacuation shelters, according to the Philippines’ National Disaster Risk Reduction and Management Council. Initial reports spoke of 14 deaths from the storm, but the official toll rose to 66 nationwide, according to the New York Times. The 560-mile-wide super typhoon also triggered flood watches in many areas. Meanwhile, local authorities are conducting search-and-rescue operations to find survivors as they clear toppled trees, downed electricity poles, and debris. ADRA’s response team traveled to Tuguegarao City, the capital of Cagayan province, to coordinate with the Office of Civil Defense (OCD) and the Department of Social Welfare and Development (DSWD) to provide initial assessments in the provinces of Isabela and Cagayan, which suffered the brunt of the devastation. The team plans to hold further assessment meetings with the OCD and other humanitarian agencies to better coordinate the response in the areas most heavily affected. Shelter kits are being prepared for distribution by ADRA Philippines as part of its emergency relief efforts, but more aid is likely to be needed as the scope of the devastation becomes clearer. 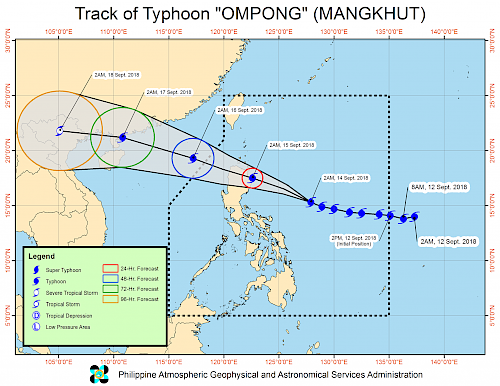 By September 16, Super Typhoon Mangkhut (Ompong) had slightly weakened, according to the Philippines Atmospheric, Geophysical Astronomical Services Administration (PAGASA), and left the Philippines. The typhoon moved northwest with maximum sustained winds of 99 miles (160 kilometers) per hour, heading toward Hong Kong and southern China. According to the 2017 United Nations WorldRiskIndex, the Philippines is one of the countries most vulnerable to disasters, ranking third in the index. Each year, an average of 20 tropical cyclones strike the country, killing hundreds of people and leaving millions highly vulnerable and in increased poverty. Mangkhut (Ompong) was the Philippines 15th tropical cyclone for 2018.